Doors open at 11pm and last entry will be 1am. Come to dance and leave your preconceptions behind, no big egos, no massive acts, no discrimination, no high fees, just a dark intimate venue with some of the purest and best cuts of house, disco and everything in-between. Vinyl and digital as one, it’s all just sound frequencies playing off each other. We’re delighted to be playing at Record Junkee, a proper record shop, dress to sweat and let yourself go. Isaac Reuben is beginning to catch the attention of DJs and producers in and around the House and Techno scene, with his tracks played across some of the best clubs across the world including Berghain, Blitz Club, and Nitsa among others. 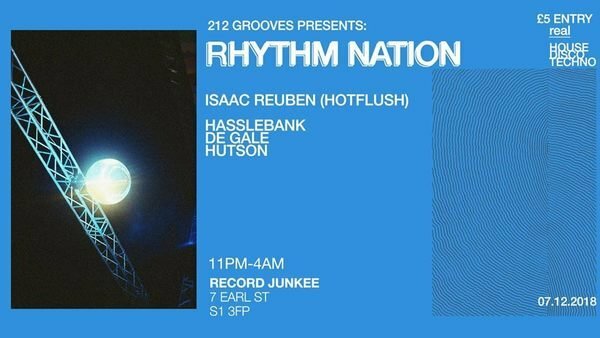 Releases on the esteemed label Hotflush and Berlin-based Rhythm Nation records have demonstrated Isaac’s different styles, whether it be bouncy House or Psychedelic Techno. Isaac’s productions and DJ sets demonstrate his versatility but also his obsession with discovering and making electronic music, both his appearances on London station Rinse FM have been well received and independent releases have also shown his burgeoning creativity and independence. We’re delighted to have him on board to deliver some rarities and get the crowd moving. hasslebank, a skilled and astute DJ with a great ability to read a crowd, he is more than capable of reaching the top, with a particular focus on the bouncier and bleepier side of house, hasslebank brings great contrast to the next DJ. Hutson, an avid record collector with the knowledge to rival the most serious record junkies, we’re looking forward to him travelling back from India to showcase some of the finest and rarest disco and house grooves to get the crowd hooked. De Gale, despite his late introduction to electronic music, De Gale has quickly amassed a solid collection, a big proponent of the raw and rough Detroit and Chicago sound, De Gale is ready to bring unflinching damage to the dance floor.